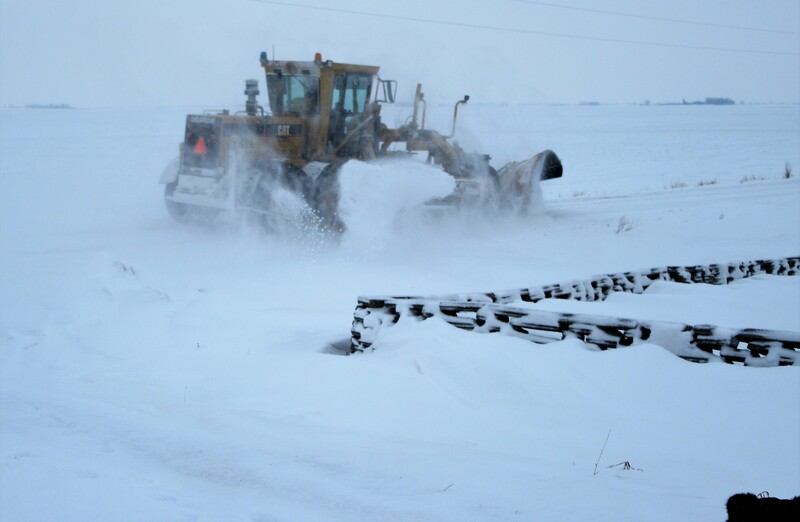 Snow plow clears our road! Thanks Ron Vlaminck…..neighbor to the south. 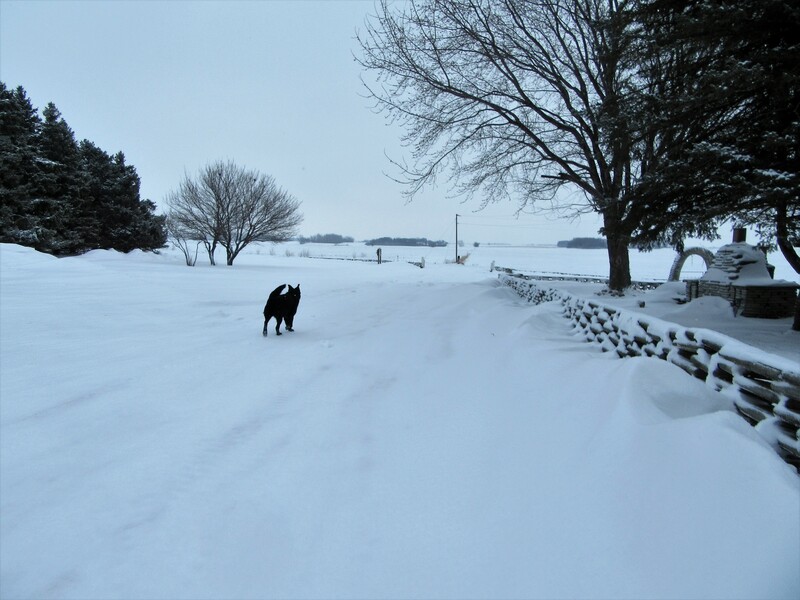 Winter is hard on the farm and I think this year may be shaping up to be like THE LONG WINTER! 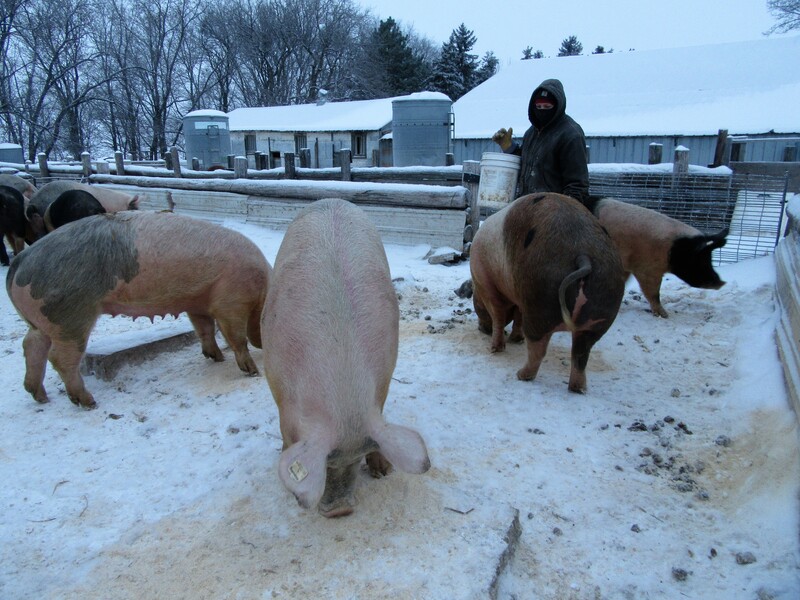 It’s been terribly cold lately but the hogs and other livestock are doing well. It’s hard to believe though when you are out in the snow and wind. We’re actually farrowing right now and the piglets are staying warm in the huts, thank God! Videos coming soon! 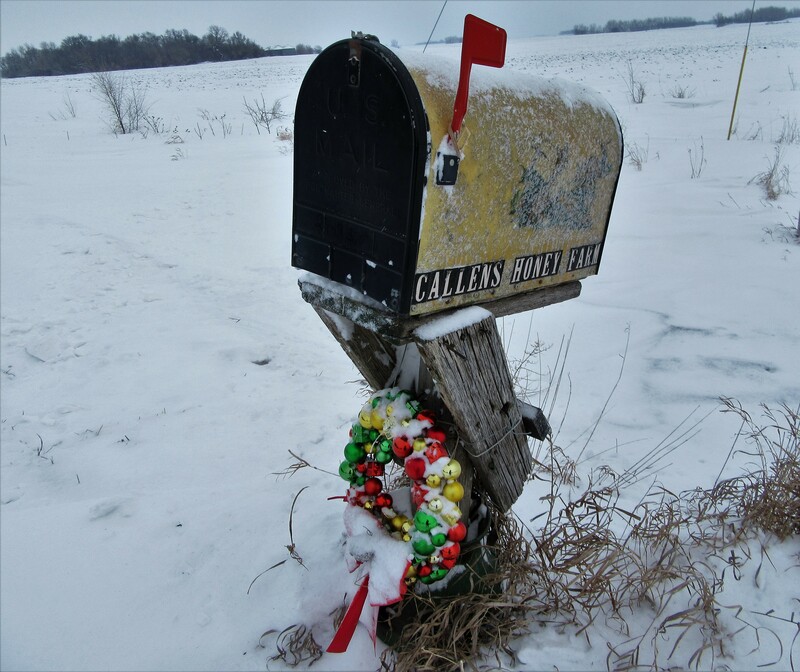 A cold rural mail box. 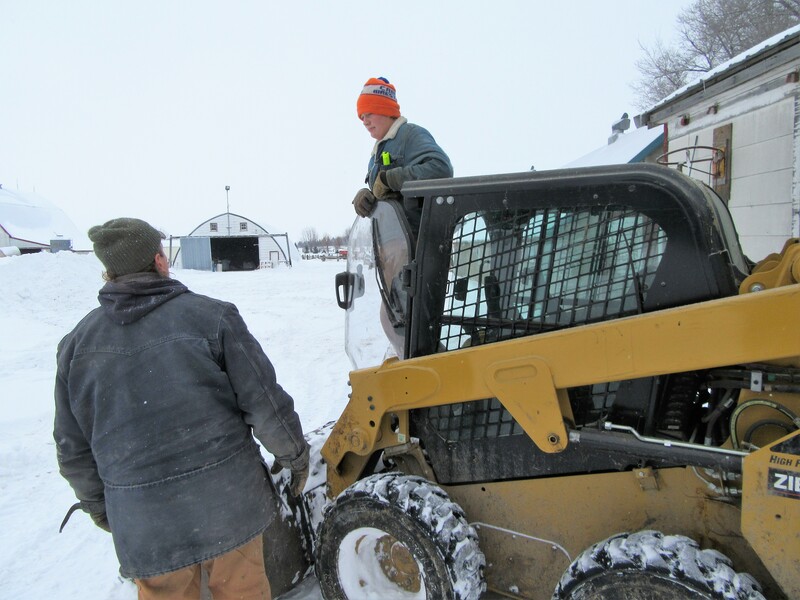 Dad and Mario discuss the snow removal plans! 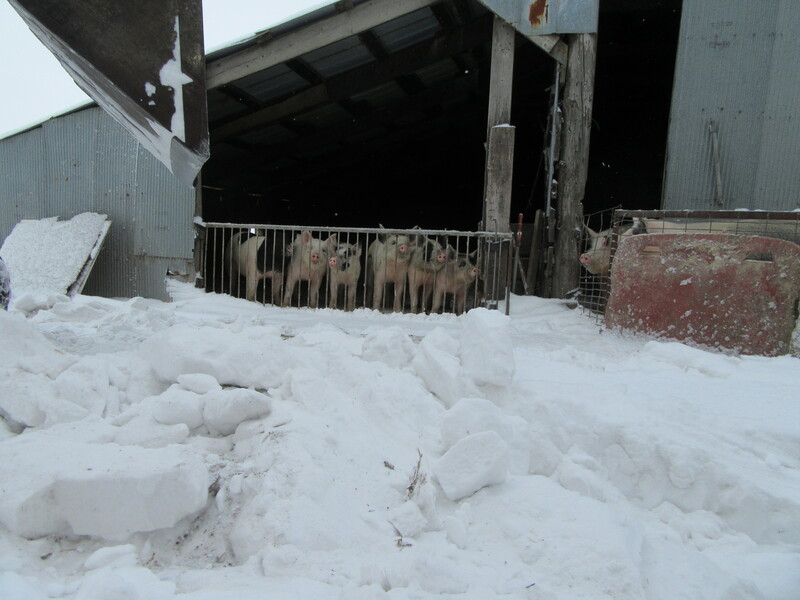 Pigs are entertained by the snow removal. 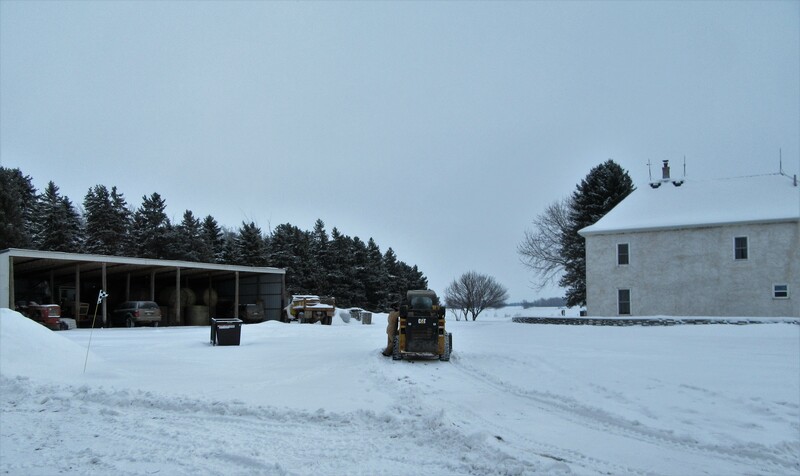 Snow removal is a big job on the farm. 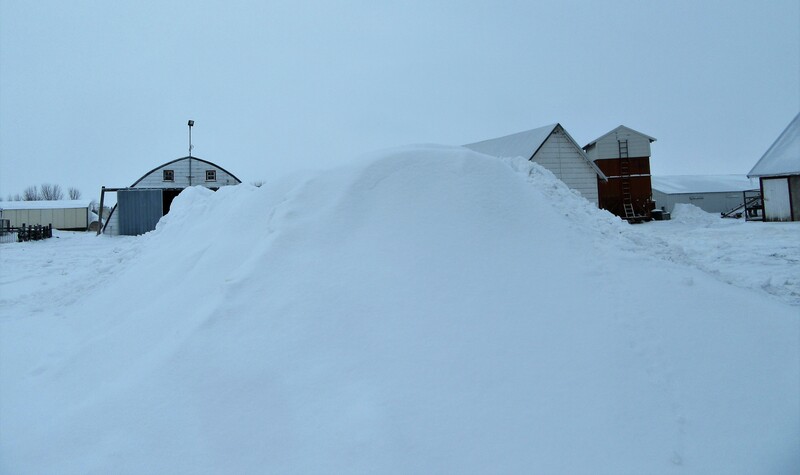 Just when we open everything up we’re back at it again due to the winds and more snow! Chores are a bit easier when the walking paths and areas are open. 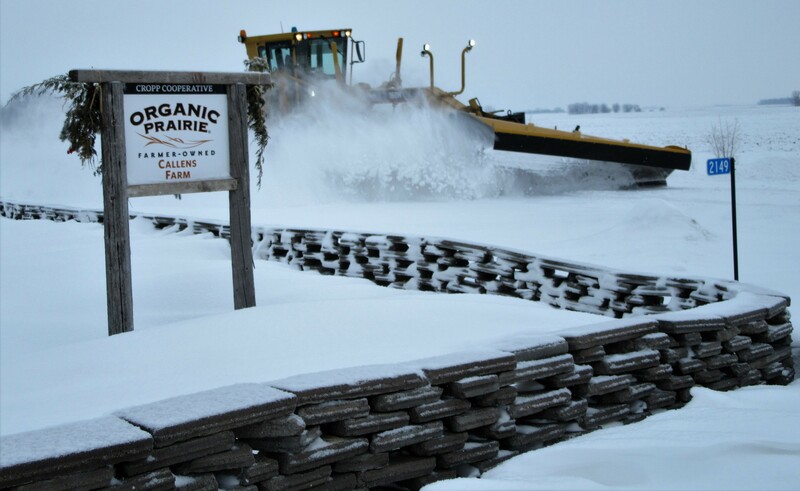 A load of Organic Prairie pigs will be shipped on Thursday and we don’t want the truck to get stuck! Reece feeding the bred mothers in very cold air! 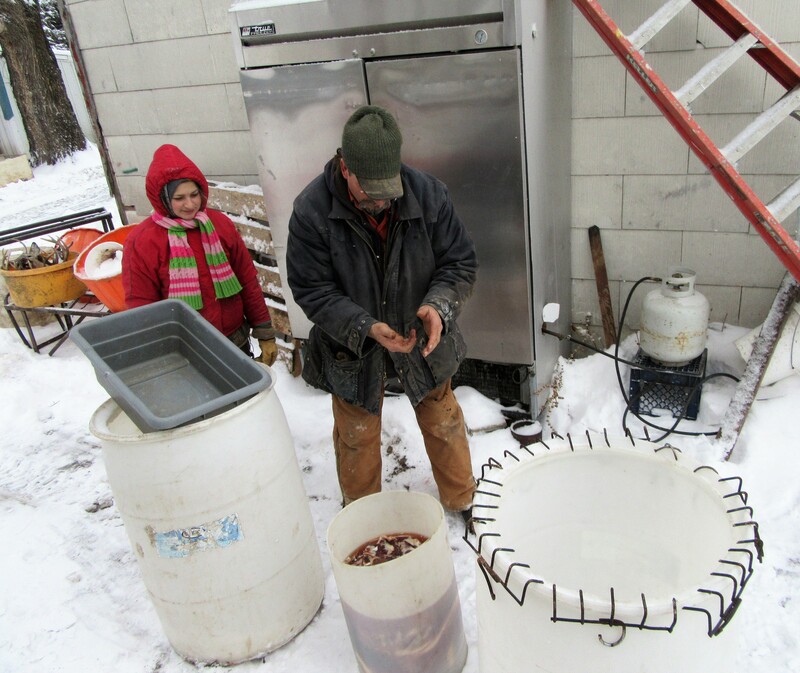 While livestock are fed and yards plowed, Fred and Bella prepare the bacon for smoking. 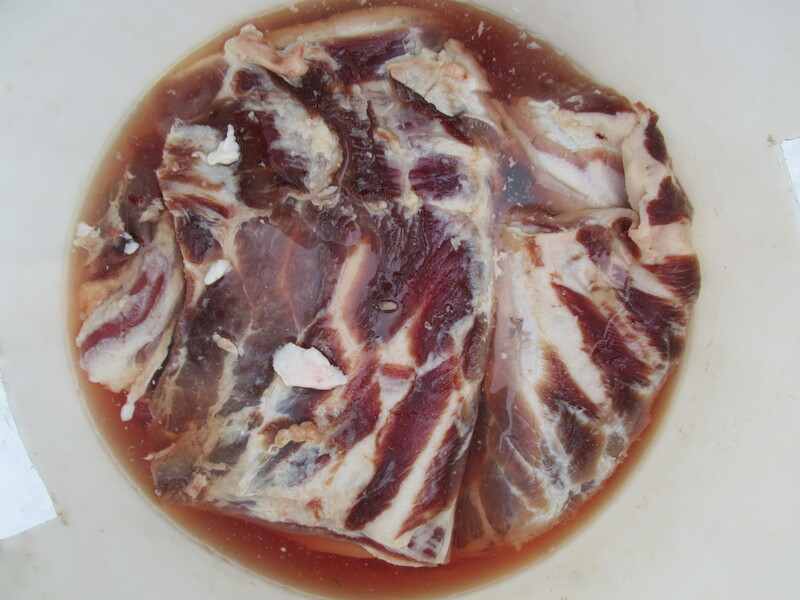 Barrel of bacon ready to be smoked. 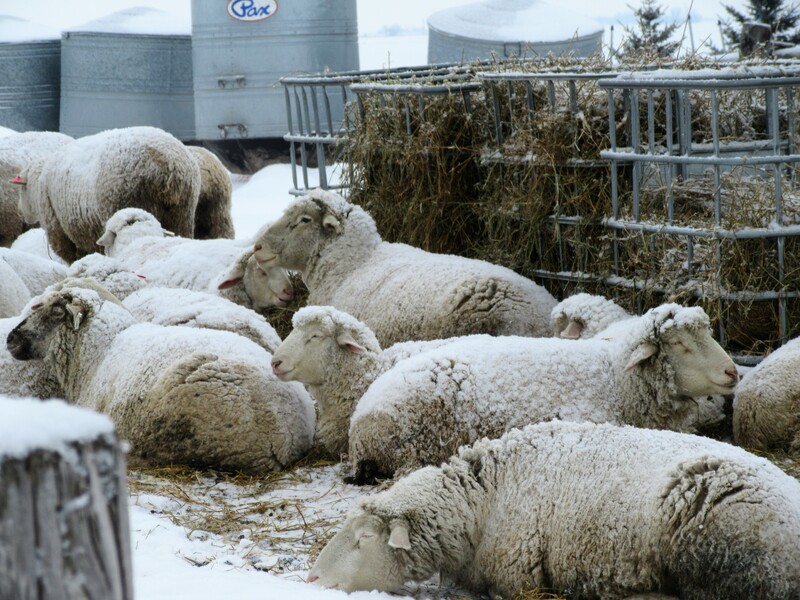 The weather doesn’t bother our sheep all dressed in wool! Chief wanders down to see the snow plow coming! 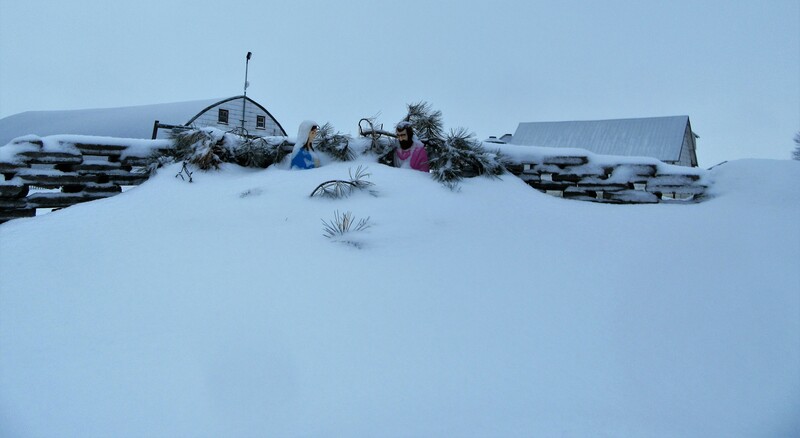 We should fire up the pizza oven…………..
More snow removal by Mario….as Maggie asks him to not shear too low for next summer. We make our hills on the prairie. This should melt in time for next Christmas! Merry Christmas 2018! 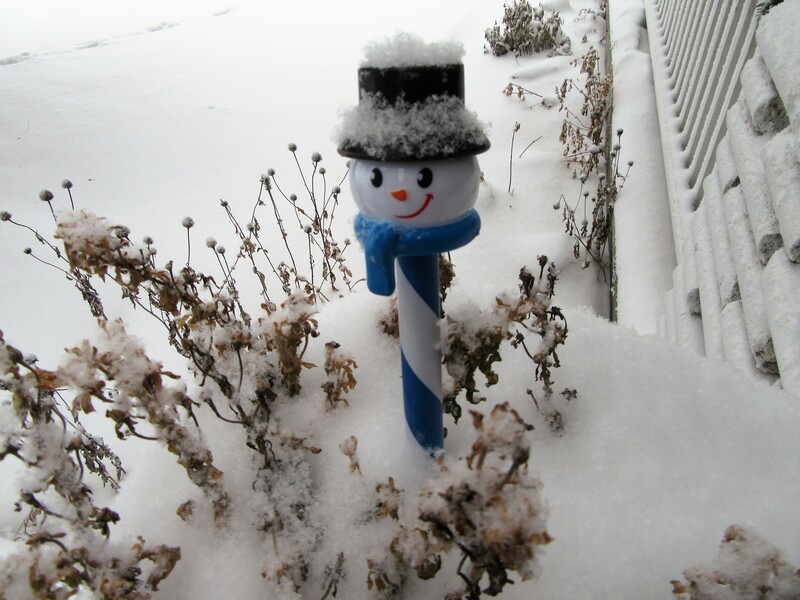 Winter cheers from the flower pot! That’s all for now. We will be uploading some videos very soon, so stay tuned. I have to go out and wrap the bacon! Thankfully we filled the propane tanks to run a bit of heat in the butcher shop. Life is good down on the farm. Yes it’s very good but by no means easy!! This entry was posted in EVERY DAY FARM LIFE and tagged Callens honey farm, Hogs, Organic farm, Organic Prairie Pork, smoking bacon. Bookmark the permalink. Always a treat. 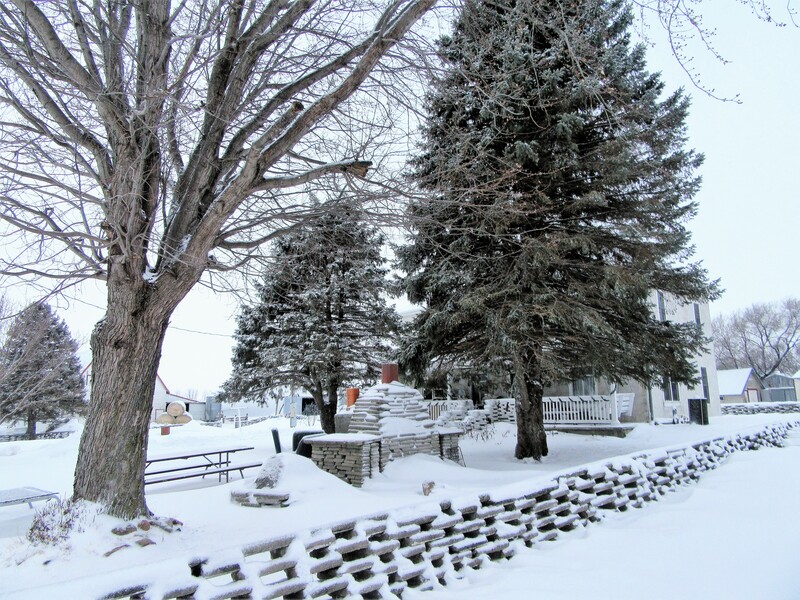 Reminds me of my years growing up on the farm, walking up the long driveway for school bus, n this was before we could wear jeans/pants to schol, brrrrr.